Tabarka or Aïn Draham? Sea or forest? Both are waiting for you in the Tunisian North-West. A paradise for outdoor activities and superb sandy beaches for holidaymakers. 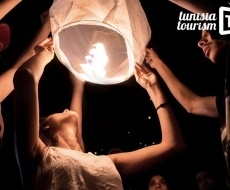 The town of Tabarka is comes to life every summer during the holiday season. All around, pine forests, rocky coves and lookout points offering panoramic views over superb untouched landscapes. The old Genoese Fort faithfully watches over this small coastal town which includes a magnificent golf course. Tabarka is renowned for the richness of its seabeds; divers meet here to discover spectacular sites and rich marine life. Buy a red coral necklace in one of the town’s jewellers: it was gathered at great depth from this coast. As for the backcountry, it is a lush green region unique in Tunisia. A mountain chain reaches Tabarka and effectively plunges into the sea. It is covered with a thick forest of oak, one of the most beautiful of the Mediterranean. Go hiking around the village of Aïn Draham and you will encounter streams, waterfalls or reservoir lakes; sometimes it even snows in winter. Feija National Park (3000 hectares) is a reserve for the wild natural life of the region. Two first-class archaeological sites can also be found not far from here, Bulla Regia and Chemtou. Perched upon a small peninsula, this fort once guarded a small Genoese colony which had coral fishing concessions in Tabarka. Rocks carved into the shape of needles, facing the small fishing harbour and marina, are illuminated at night. 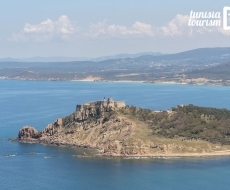 Excursions can be organised to this magnificent volcanic island, around sixty kilometres off the coast of Tabarka, at the heart of a nature reserve. The red-roofed houses along the mountainside, surrounded by forest, give Aïn Draham its charm. At this archaeological site in the heart of a mountainous landscape, you can see historical marble quarries (yellow marble, extremely sought after in the ancient world). Next door, a beautiful modern museum. After visiting, you will know everything about the former inhabitants of the region, ancestors of the Berbers.